Ear Pieces is a new interdisciplinary venture, hosted by the Faculty of English at the University of Cambridge, and funded by the Wellcome Trust. Building on the latest research undertaken in the environs of sound studies, it is the first initiative of its kind to assess the mutual legibility of medical and literary records, and so to kindle a dialogue between specialists from the humanities, neuroscience, and clinical medicine. 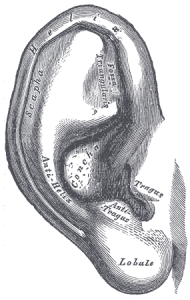 One aim of Ear Pieces is to illuminate, in the course of discussion, the definitional contours of harmful listening in the last 200 years, from colloquial strains of otitis – ‘glue ear’ and ‘swimmer’s ear’ – to peripheral kinds of hearing loss, impairment and excess, such as otosis, sound-blindness, melomania, and Involuntary Musical Imagery. How have such complaints been understood historically? Whose vocabulary are we drawing on when we speak of neurotological trauma? In what ways, and to what ends, have poets, novelists, and musicians addressed the challenges and opportunities of representing sonic modernity? Over the course of 2 days in December 2016, a diverse group of listeners will meet in Cambridge to discuss some of these questions. In doing so, our aim is to excavate the parallel histories of otology and the humanities, broadly conceived, to evaluate their intersections and points of resistance, and to gauge their present affinities, in public policy and the popular imagination. Please send 300-word proposals for papers of 20 minutes, or 500-word proposals for panels of three papers, to Edward Allen – ejfa2 [@] cam.ac.uk – by Monday 29 August 2016. We plan to publish a selection of essays stemming from the event in a special issue of Critical Inquiry in 2018. Details regarding conference registration will be made available in due course. All enquires in the meantime should be directed to Edward Allen.